1. Click on the "Edit" icon for the class. 2. Click on the button labeled "Convert to Master Class". 3. Click on the "Edit" icon for the new section. 4. Modify the co-instructor or TA information & then click "Submit"
5. Confirm that the section name and section enrollment Key are correct & then click "Submit". 6. 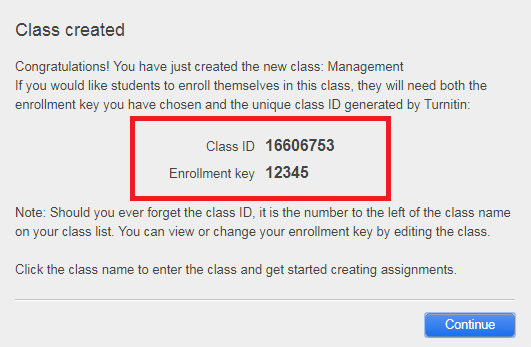 Provide the class ID and the class enrollment password for the section to students for enrollment, then click "Continue". 7. This is how the section appears in your home page. Note: All students and submissions that were previously in the standard class will automatically be moved to the section class. To access the section, please click on the section name. Students will not know that anything has changed. If you have students who are not yet enrolled in the class, they will need the section ID and Password to enroll.